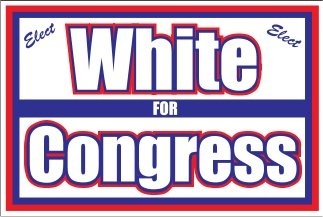 Cheap but high quality political yard signs from the yard sign printer advertising specialist! Political Yard Signs win Elections!! Wire stands are extra. Note the sign industry is moving towards using shorter wire stands. The shorter wire stands cost less due to less steel, and shipping charges are also significantly less. The short stands like the 6x24 are very strong and withstand wind very well. We still stock the popular standard 30 inch wire stands. For quantities of 5,000 or more, call us at 321-253-0424. You'll get the best price! Printed on durable, corrugated material, these political corrugated plastic signs are guaranteed to last at least two years! We offer free advice on designs from the experienced business sign printer, the conservative sign company. We have the reputation for quality, best value, and integrity. To follow the Golden Rule is our mode of operation. Our low prices on wire sign stands along with cheap prices on political yard signs makes Heritage Advertising the cheapest to buy around. Unlike the competition, we will sell the wires separately and with the ability to ship these from 20 locations including east and west coast, we can provide lower prices than the competition. Note that we have the best prices on the internet for quality wire stands and we do not sell junk like a 6x15 wire stand that questionably works, and our wire stands are quality and will last for years. Beware of cheap Chinese made wire stands. Recently America has been flooded with cheap substandard wire stands from China. The quality is inferior and the wire stands easily break. Before you place your order for wire stands anywhere, insist on getting high quality American made wire stands or frames. Those companies offering free wire stands normally give you the Chinese made that easily break. Others offer the 6 x 15. These are only 15 inches tall, with one connecting bar between posts, and the sign sits on the ground. Being low on the ground and grass in front of it, the sign is difficult to see, thus defeating the purpose of the sign. These stands will hold the sign up and for those on a tight budget, we will provide them to you. For those offering free stands, the 6 x 15 is normally their special.